Resident Evil 6 Part #15 - It's a Miracle! Part 15: It's a Miracle! With this, 2nd to last update goes up. Voting on numbers is done Enjoy Chris finally getting the hell out of here too. Update 15 - It's a Miracle! -Files are a bit underwhelming, the main ones to read are about the underwater facility they used to extract magma and study the organisms thriving under its extreme conditions and add their traits to the C-Virus. 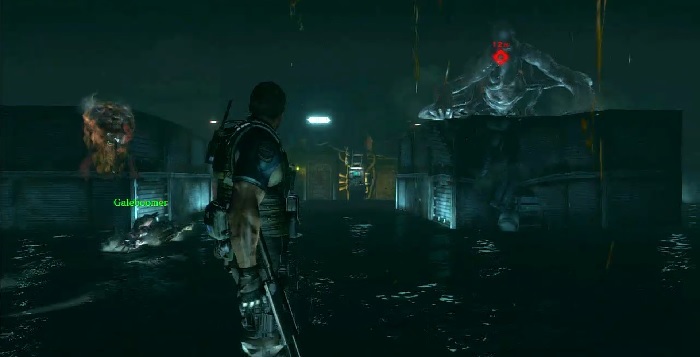 There is a file on the Haos and that it possesses a gas more dangerous than the Lepotitsa, a recap of RE5's events between Chris & Wesker, and a file on Piers himself. That being said, there wasn't much to talk about despite this new area. There's a dearth of interaction with the environment at all, it's still the same action with normal enemies, and we won't see anymore normal and fight-able enemies from here on in a properly designed level. I mean of course there's the cross-over with Jake but, let's be honest, that doesn't count. The big things to talk about come with the boss and I thoroughly rant about it during game play. As I've said, this is the part of the game where everybody (rightfully) gets frustrated with the design because of its precision requirement, then the immediate dumping of you on the doorstep of an underwhelming and pointless fight, then repeating the process for good measure. What a shame we could not truly explore this facility! There is one problem though I'm having lately. Whenever I upload a video now it crashes my modem and it becomes a chore trying to get it to work. When it does work, I can't so much as refresh a web page without it dying again for about 5 minutes. Dunno why but yeah, this could delay Jake 5...WHICH ALSO HAPPENS TO BE COMING ON FRIDAY! I think this one probably fits Chris too! Captain Swing makes awesome gifs in the RE Megathread in Games. Please finish your damn food. And thanks again to Galeboomer for joining for co-op.